Hello and happy end of the first month of 2017! 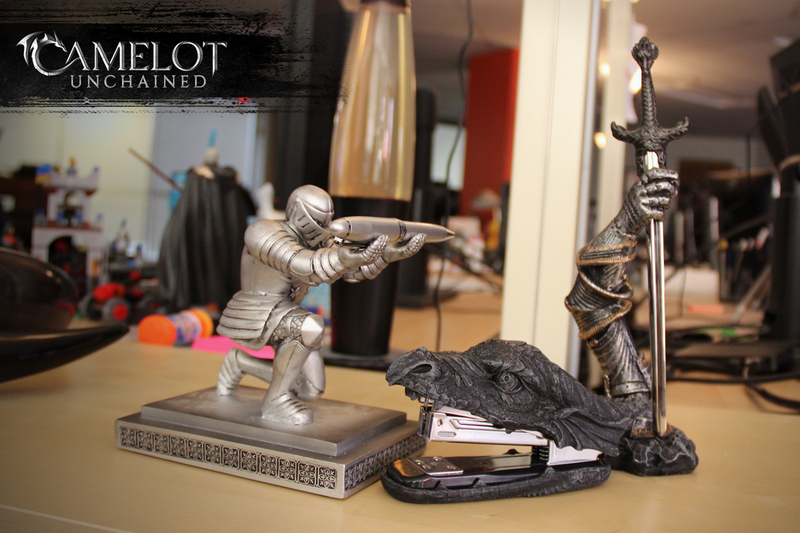 It’s a new year, one that will certainly bring many new achievements, challenges, and most importantly, fun in the development of Camelot Unchained™. We’re really looking forward to sharing it with our Backers! As I write this, we’re finally getting the second snowfall of winter here at City State Entertainment™, a light snow in keeping with the unusually warm winter. It’s pleasant, and a lot easier to deal with than an extra cold one! 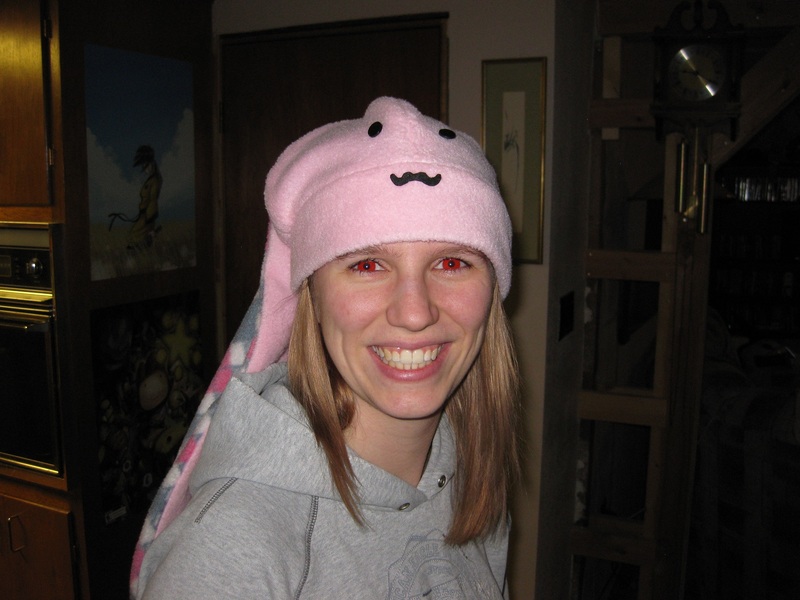 Christina hails from the Pacific Northwest, and has been making neato software up there for over ten years. She spent her early development years learning disciplined coding principles in the secret monasteries of the coding monks. 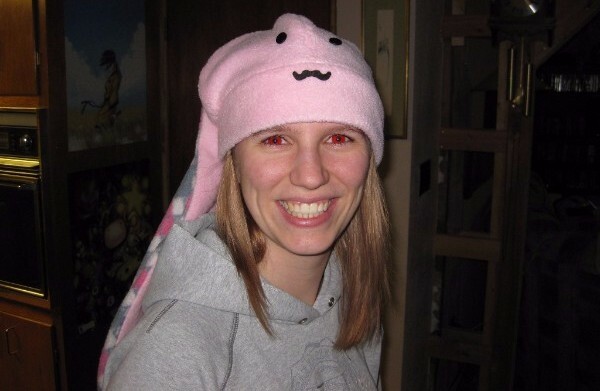 On the game front, she was a major contributor on the Scribblenauts and Marvel Avengers Alliance franchises, specializing in gameplay programming. Her hobbies include classic Z-cars, greyhounds, cooking, and mask making. To see just how busy we’ve been, head on deeper into the newsletter for the State of the Build article from Brittany, which is jam-packed with some of the fruits of our labor. Because it is so packed, and also because of how hard-working our engineers really are, there’s no Tech Central article this month. As heads-down as we’ve been, we didn’t want any of them to lose focus on their work on Beta 1 long enough to write a great article for this newsletter! Fortunately, we’ve got you covered with another excellent Dose of Design article from Ben, and an Artitup written by special guest writer Dionne (not Scott this month, he's way too swamped with his work on animations)! Plus, the climactic conclusion to The Great Depths™ Raid story and other fun stuff can be found toward the end. As ever, we have striven to keep you all as updated as possible, between streams on YouTube and Twitch, as well as weekly updates with news, and regular emails about playtests. So without further ado, please remember to click on the "View this email in your browser" button on the top right to see the whole newsletter. Read on for articles, art, lore, and all the goodness you might expect, and please enjoy this, the thirtieth issue of Unveiled. 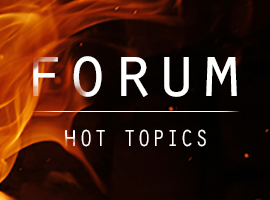 The latest topics of discussion on the forums right now include gathering materials, protecting crafters, and of course death and dying. Join the discussion on the forums on our website to bring your thoughts and ideas to the table! Huge thanks to Jorvald and Clan Sverker, who sent us these ten amazing drinking horns! They are really cool, and look amazing. Here’s to a hearty swig of mead after a battle! So many thanks are due to Ludovic, who has sent us so many gifts. :) Let the halls ring once again with Ludovic’s praises, as he sent me (Max) these astonishing and gorgeous office tools. A pen holder, stapler, and letter opener have never been so cool! Thanks, Ludovic! “Papa, where are going?,” asked Ulla as she scrambled over the barrels and baskets to join her father on the wagon’s front seat. Ulla’s brother Jurgen came up besides them on his horse. “Don’t forget the blood, father,” he said with a teasing look at his little sister. “Wise rule,” finished his father. The Alignment Paradox; On this day, once per year, the Veil, the Depths, the moons and the planet align distorting the barriers that separate them allowing for physical (and physics) crossovers! Nothing is as it appears and everything is as it should never be! Making things worse abominations escape into realms they are otherwise banished from. Reality itself breaks down as friend, foe, and abomination all become indistinguishable! The only day more feared than The Alignment Paradox is Dragon's Day. Drowning Door Day, a sacred Viking day. On the night a viking man or woman is declared a Viking Warrior. They are tasked with an impossible challenge. They must Drown a Door. More often than not they just drown themselves in spirits instead. I laughed, hard. :) Now, for our next contest, it’s time for Fan Art once more! This month, we are presenting the epic conclusion to The Great Depths Raid, which can be found on the Lore page of our website. Choose a character from the tale to illustrate, whether by painting, finger painting, drawing, or dressing up for a photo, using the story for inspiration. 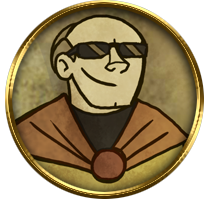 Post your creations to the thread you'll see pop up in the Fan Art section of our Forums, and we'll showcase one or more of them in the next newsletter! 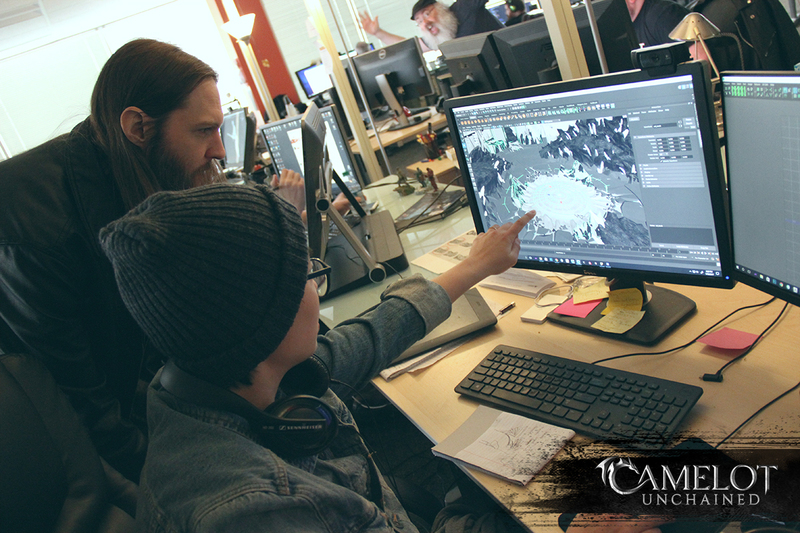 As work continues toward completing our feature set for the start of Beta 1 testing, the emphasis for our ongoing development slowly shifts from creating limited prototype features for testing server and client performance and stability to building out player-facing content that will provide a first look at what Camelot Unchained will eventually become. There will, of course, still be a heavy emphasis on performance testing once we enter our first phase of Beta, but unlike our current Alpha builds, by the time we reach Beta all our core features need to be working together in a way that starts to convey some of the fun that will be present in the final game. In terms of combat, work continues on the visual effects, sound, and animation systems, in order to provide an exciting look and feel to the game, while also communicating key information about nearby allies and enemies that players can use to their advantage. A selection of initial ability components, as well as passive Banes and Boons for each character, have been composed in XML and will be ready to start a round of more thorough testing once their associated audio and visual elements are in place. Additionally, new armor and weapons have been created, with stats to match the new abilities and unique models to fit each Realm. There still remains some work to be done to allow characters to equip all of these items in the way that we want, which is obviously a very big part of getting to a point where we’re ready to start taking a deeper look at combat balance and fun. Since a lot of the combat we want is meant to take place around objectives, we’ve also got a lot of time and effort directed toward building out our first Place of Power (as you can see from some of our recent updates). 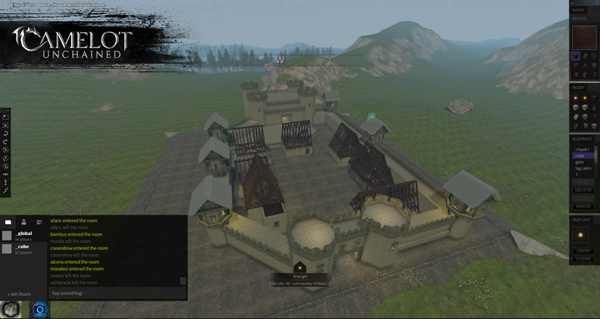 We’re also working at improving our building system, including stability and destruction, which will allow for our first round of siege testing. In order to knock down buildings, we need to put together a basic siege engine. This opens up a whole range of other features, such as reticle-based targeting, the ability for a character to deploy a gameplay object in the world, and the ability to walk up and interact with an object in order to use it. While little features like these don’t take long compared to, say, rebuilding our entire ability system, they still add up to a sizable amount of work that must be overcome before we can see how much fun our first iteration of sieging feels. To fill all the space between objectives, and to provide options for locations where fortifications can be built, a large amount of world space must be created. This is largely being accomplished via our procedural terrain system, using environmental assets specially created to make up each biome. 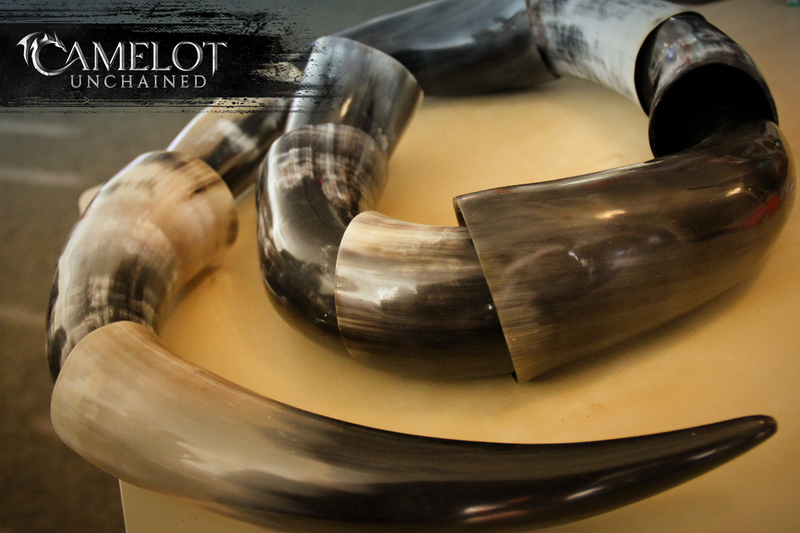 In order to facilitate specific gameplay, however, a lot of work also has to be done by hand. This means going through the procedurally created map and making edits to the terrain, balancing open areas with choke points, creating switchback trails between areas of sharply different elevations, and so on. To see if the world we create is truly fun to play in, however, we’ve got to get all these other important pieces in place, so that we can judge our area design not just based on aesthetics, but on how it shapes gameplay. The open world area we’re creating also needs to support the gathering of materials for crafting, for which we’ve already got the basics of a resource node system in testing. There are still more gathering features needed before the start of Beta 1: For example, we need to provide more easily identifiable visual indicators for resource nodes, make sure it is obvious whether a node is full or empty, and even improve the way that gathering actions are executed by players. These are just the basics, and we’ll definitely add a lot more features to this system later on, after the start of Beta 1 testing. Since crafting is one of the core features for the game, providing a solid foundation for gathering the resources players need to craft items is extremely important. The multi-step process of crafting itself is also getting a lot of attention, in order to fully implement the formulas that will allow raw substances to be refined, blended into alloys, and used to generate items with all of their proper attributes, based on the type and quality of substances used. As with gathering, there will be a lot more work going into crafting beyond the start of Beta 1, but the core gameplay loop of gathering, crafting, and using items is one we want to start with early. That way, any issues with the core principles of how items are created show themselves right away, and can be resolved before many layers of additional features are built up around them. As you can see from our User Stories page, there are of course many more features we’re going to be working on, from metrics and progression, to NPC guard AI, all of which will be coming together. At first, the focus will be on stress testing to ensure we maintain our performance standards. Later on, this will shift to evaluating the gameplay value these features add as they become integrated with the rest of our core features and start to provide a look at the type of game Camelot Unchained will eventually become. For those of you already participating in our early rounds of testing, expect to see a lot more new features coming together. These features make their way into the game, and will start being refined and expanded from very basic functional systems to full features that will make up the content of the game. I’ve been in the industry since 2001, when, upon meeting an Art Director for Tiger Woods PGA Tour, I was asked if I’d like an internship. This is a common place to start in games. It’s generally a balance of menial work to learn the ropes with lots of learning opportunities to see where you want to focus, plus figuring out how best the company can make use of your unbridled enthusiasm (as in "Oh my god, I’m working on a video game!"). The important thing your employer and direct reporter has to balance is the time it takes to bring the intern up to speed vs. the amount of time saved on their own workload. In my time in the industry up until working for CSE, I’d worked with a bunch of people as a lead, but I hadn’t yet been required to go out and find my own intern. Knowing what I know now, my biggest concern was finding someone who was not only enthusiastic, but hardworking, quick to pick up new ideas, and had a desire to learn and grow. All of those requirements really lend themselves to adding to the project quickly vs. taking up more of my already limited time. So here’s the big takeaway from my preface: I totally lucked out not only in finding Dionne, but in getting her to hitch a ride on this crazy adventure! 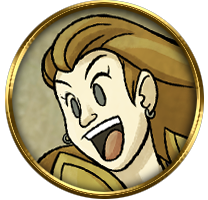 Dionne has evinced an enthusiasm for her work, as shown in her piece this month, and has also been more than willing to help out on character and weapon modeling and materials, something that was not expected, but which has been invaluable these past months. I am truly thankful to have found such a talented person to join the team, now as a full-time employee of CSE. I just hope I can live up to her expectations, and pay her back in full by sharing all that I have learned in the industry since I myself started as an intern. Hi everyone! In this month’s Art it Up, I will be taking you through the process of making the Place of Power. I’ve had the honor to create this environment as my main project for the last couple weeks, and it has been an intense learning experience. As usual, working with Michelle was a breeze. All throughout the process, she was very clear with her vision: creating a grand and ominous space that would inspire players to fight for power! She drew inspiration from cracking waves of lava, steep shards of rock, and various crystals to give a mystical and dangerous atmosphere. We worked closely during the process to make sure everything I made fell in line with the original concept. This project was the first time I have been able to work directly with Ben. Having his input as a game designer really helped me create a space that is more interactive for the player. We had a lot of back-and-forth editing, where I would make tweaks and then Ben would play through and give me input on player distances, collison, and maps. This kind of process really allowed me to prioritize gameplay, and challenged me to balance the aesthetics and the functionality. There was a lot of trial and error that went into making this area, and a lot of changes were made to allow players strategic vantage points over the open middle space. Right now, the Place of power is about halfway done. The silhouette is pretty much set, and that leaves the refinement still to be done. I’ll create debris and other little details to give the player a more realistic and visually interesting experience. My goal is to make every inch of this area unique from every angle. An aspect that I am personally looking forward to (and hope you are too!) will be the light emitting from the crystals. I’ve never done lighting like this before, and I am ready for the challenge of incorporating it in a natural and aesthetically pleasing way. 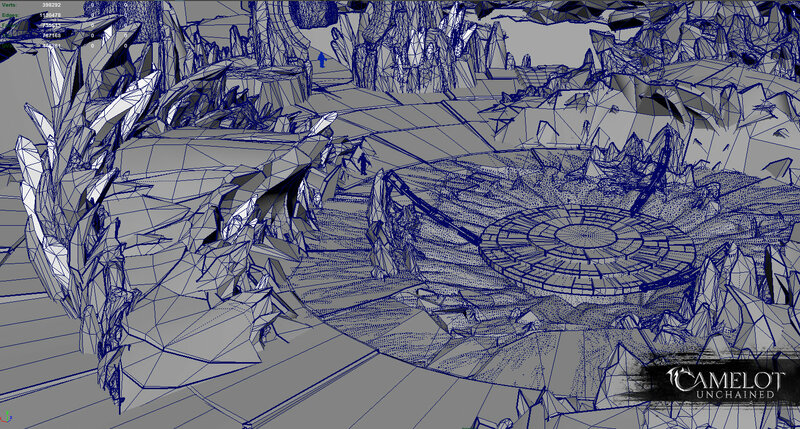 Other things you’ll see in the next few days include the start of unwrapping assets and putting on base textures. Here I am working on it with Ben! Working with a designer like Ben and a concept artist as talented as Michelle is always the best. 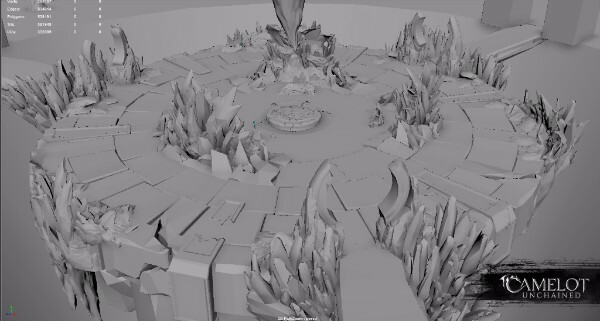 The design that she and Tyler came up with for the Place of Power is incredible to look at and to make. Also, the opportunity to work with Ben has really stretched me as an artist to think more critically about not just the looks, but the ease with which the player is able to interact with a space. Everyone that has guided me during this project has allowed it to become the best environment it can be, and I can’t wait until we can show you the final product. The great thing is, we're going to take a lot of this hard work and find a way to turn it into its own mini biome around the PoP. Tyler keeps reiterating that we need to work smart on these bigger pieces. Yay! Woo hoo! Ta da! Following a relaxing holiday break, CSE came out swinging in 2017. After making lots of progress in the ways of bots, animation, rendering, abilities, and much more at the end of 2016, we’re now more heads-down than ever solidifying our codebase, expanding on our existing architecture, and tackling new features, thanks to our growing team. After much anticipation, Andrew has merged his first phase of improvements to the animation system into the mainline. The major player-facing change is the vast improvement in animation blending. Multiple different clips are referenced at a single time during a movement cycle. This makes motion look far more fluid when characters turn, change their speed, transition from state to state, etc. On the tool side of this change, Google Sheets has been integrated into the animation workflow. This allows our animators to copy and paste values and names into cells in a way that significantly cuts down on the time to enter data. Sheets also displays errors when the data is unrecognized. You can actually see an example of this in a recent stream. Tagged expressions were a major addition to our Banes and Boons system, and gave Ben a lot of flexibility in how he is able to modify data. Tagged expressions gave Ben the ability to distinguish values as being 'Damage' vs 'Cost', 'Fire' vs 'Ice', 'Magic' vs 'Physical' etc. Then he’s able to state things like: "All fire damage is increased 5%" or "All costs are reduced 10%", with arbitrary specificity. After implementation, it became clear that incorporating this new system into our existing abilities system would extend functionality while requiring less code to be maintained. Bonus! Fixed the interaction between disruption and auto-applied ability skill nodes where the marker tag was being lost and so things were getting applied twice and failing. The building code had developed a bit of cruft, having not been tended to for a bit. Rob was able to brush the dust off the system and get the core loop working again, allowing us to have Backers jump in for a weekend test. Following a Backer test, we addressed more ancillary building systems that also needed to be brought into the present - like displaying the correct output in the combat log, and updating the UI. Changed the APIs for getting BuildingGrids to speed up iteration over their children. This had the added benefit of making the code significantly less complex. We improved the threading model for creating building renderables. Changed the available slots from a single set of flags to a list of flag sets. This list defines each valid combination, and also defines priority for the list. This makes it easier to support and maintain left-handed vs right-handed vs left OR right-handed vs two-handed items. Sets of gear slots are read from CSV files as the flag number with a way to split multiple sets. We’re now updating the current data files for armor and weapons to conform to the new standard while maintaining the current gear composition. We now wait for physics to finish loading before creating dropped items. This fixes issues caused by querying the terrain height before the terrain existed. Server auto-restarts make significantly less noise on the console. It’s also much easier to configure intervals. We split out hard launches and soft launches from each other so that hard launches won't stop soft launches from occurring. We started working on exponential backoff, an algorithm used to pace out repeated retransmissions of the same block of data, which helps us to avoid network congestion. When performance on the game client starts running slow (less than 30 FPS), it makes the server difficult to update. We’ve added a slash command that limits the server update rate for the current client, a pretty handy debugging feature. We upgraded from OpenSSL to LibreSSL. OpenSSL is a software library used to give us secure communications over the network. LibreSSL is based off OpenSLL, but is more secure. It also has the benefit of having the exact same APIs as its predecessor, which means dropping it in just…worked. We continue to make speed improvements to our particles. On the main line, particles are 5-10 times faster (depending on your machine). There are still many more improvements we can make, allowing us to increase performance even more. A debug variable was added to the client that will spawn a random assortment of local point lights around your player, kind of like a debugging disco! For simple threading jobs, we can now immediately do the work if there are no conflicts. Fixed a bug where cancelled tasks could sneak through one extra run. ParLL, our threading library, allows overridden assert handlers, which allow internal errors in ParLL usage to be caught by the CSE assertion system, alerting us when things don’t work as expected. Threading within our terrain code was vastly improved to take advantage of all available cores and avoid locking threads when editing data in our tools. A while back, we started adding ‘trash’ tags to the editor, a way to manually mark and filter out unused assets. This change was propagated to our material editor image selector, item editor, the image set editor, the FBX wizard, and more. There’s now support for previewing sound packages from within the editor. The gameplay config XML editing experience has been improved from what we had before. One of the major gains is that we can now validate from the editor that the file parses correctly and compiles. Fixed a nasty bug where chat would randomly swap back and forth between global chat and the combat log, which added quite a bit of difficulty to verifying things were working in game. Ben regained the functionality to set up default abilities for testing purposes. We made some VERY large islands for testing - 256 square km, and then 1024 square km! The subzone count also needed to increase from 2x2 to 5x5 to support this. Fixed a stack corruption in the patcher when using windows function for Windows 32/64 check on the patcher. Fun fact: BOOL is not equal to bool. Zones now have a world space translation, specified in the game server's config file. The positions for doors, buildings, and items were then updated to support this change. Two characters of the same Realm will now collide with each other unless one or both of them are in Travel Stance. Allow me to present the climactic conclusion to The Great Depths Raid, a twelve-part serial novella about The Depths. It’s been a true journey to write this epic story! Working on a serially published work has been a very interesting experience, and very different from the pieces I usually write (like rewriting or writing original Becoming™ stories with Mark). I hope you’ve enjoyed reading the adventures of these Delvers as much as I have enjoyed creating them. In particular, it’s been an absolute blast to take the opportunity to really explore some of the possibilities of a horror setting like The Depths over the past year. In many ways, The Depths is a character itself, and I’ve tried to capture the eerie and disturbing qualities and inspirations that Mark came up with years ago for the RvR dungeon stretch goal. Read on for the climax this series has been building toward, or check out any parts you might have missed first. 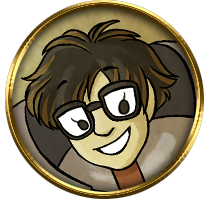 You can find the first, second, third, fourth, fifth, sixth, seventh, eighth, ninth, tenth, and eleventh parts of the tale in the Lore section of our website, here. Nearby, the shadows flickered and flowed like liquids as the rush of claws and pincer met an explosion of bright lightning. Furred and armored, Hidduk thrashed, his tall, arched tail striking down to pierce the armored Frost Giant. His swollen form dwarfed her now, but Fogja struck back, her hammer cracking claw and crushing chitin wherever she stuck. The smell of burned hair filled the passage, along with the acrid miasma of poison as the enormous stinger gave her another near miss, penetrating the floor by her foot with a thunderous crack. This small outpost under construction was created in C.U.B.E. by ProphetWtf. It’s pretty neat! Copyright © 2017 City State Entertainment LLC. All rights reserved.